Smart NDT Academy is an established training institution set up with an objective to promote NDT Operators, Supervisors and Engineers to a level of international acceptance through systematic training and guidance. This training is designed to qualify candidates to ASNT Level I & Level II as per latest SNT-TC-1A guidelines. Due consideration is given to impart hands on training to enhance practical knowledge. NDT Courses are conducted by experts having vast experience in NDT operation in various industries such as BARC, NPC, IPCL & qualified ASNT Level III personnel who have spent their life in the profession of NDT. Courses are designed, upgraded from time-to-time based on past experience. These courses are being held at our newly constructed centrally Air Conditioned conference training centre. 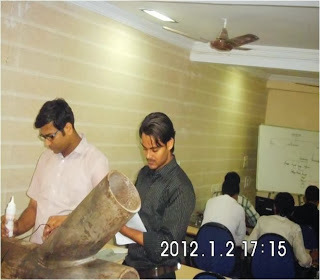 Latest equipments are being used at Smart NDT Academy to impart practical training. Course material may be collected in advance from office on enrollment. Accommodation facilities for limited nos. of participant can be provided on I st come I st basis. Part time courses can be arranged for a group of minimum five candidates. Institute is also undertaking courses at outstation for corporate, Multinational companies having enough participants & facilities at their premises with advance notice. b) Passed Level I Examination – 2 years assignment as Level I. Candidates should not be “color blind” and able to read “JAEGER” letter size 2 with or without glasses.
? Classes shall begin at 9.30 am to 6.00 pm on all the days.
? Candidates are requested to report at least half an hour before the scheduled time on first day of each course.
? Due to limited number of seats, candidates are requested to register at the earliest for better communication & understanding.
? For Registration, candidates shall complete enrollment form duly filled and signed with five copies of passport size photographs, certificates and course fees at least 7 days in advance.
? Unsuccessful candidates can appear for re-examination on nominal fees of Rs. 750/- after a period of two weeks.